My Guinea pig has moved on. 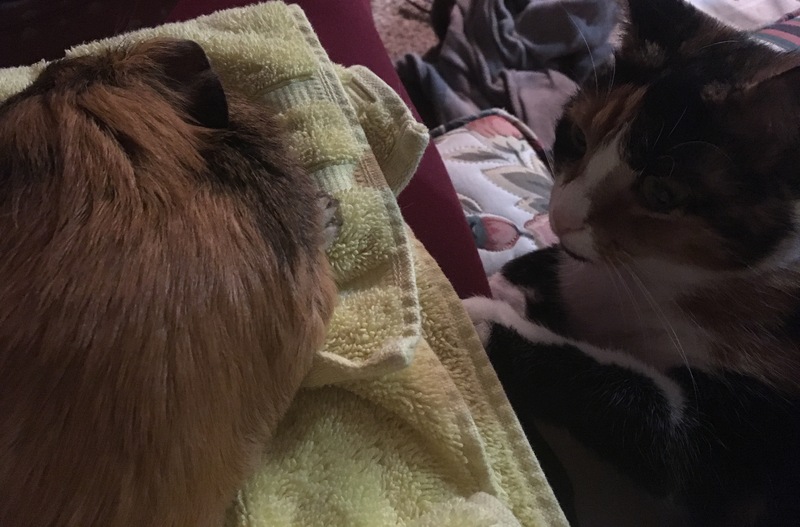 After singing All Things Bright and Beautiful to Addie the Guinea Pig, as he lay in a towel on my lap, I offered him the above verse I wrote for him, to the tune of For the Beauty of the Earth, as a gift to send him to eternal slumber. After googling sudden Guinea pig death and some of his behaviors, it appears that Addie had a stroke. Addie brought much joy and laughter to my life, and even more when he was introduced to Andrew’s cat, Reese. They quickly learned to coexist, in fact, Addie’s assessment was that they were best friends. Tonight, Reese snuggled beside me while I comforted Addie, and when he sensed her presence, he maneuvered himself so that he could be as close to her as possible. Say what you must about animals only being affectionate to get what they want. I’ve never believed that. I’m so thankful tonight for the gift of animals’ capacity to love and form companionship bonds with each other, with those different from them and with their humans. And maybe it seems strange, but it’s comforting to have him go in the same month in which we celebrate and commemorate my favorite saint, Francis of Asisi, the patron saint of animals. He reminded us that God’s caring knows no end – even down to the smallest creature. Thanks be to God for animals, and for those who love them. Adoniram Judson Robb-Scott, you will be missed. Give my best to your brother, Oliver Elizabeth. Y’all will have a big party in clover heaven, I’m sure.